← Staunton, Virginia. March 8th, 2011. Bob Monaghan wakened to a loud boom on Monday morning – then saw an oil truck stuck in a sinkhole on Conant Drive. The truck had been on its way to Monaghan’s raised ranch to fill the oil tank, but it never made it as its wheels got stuck in thick mud oozing from underneath the pavement. The 8:15 a.m. incident led police, fire, DPW crews and two large cranes to the cul-de-sac on the city’s West Side to remove the truck from the deep rut. “The most amazing thing was they put a big yellow strap around the truck and literally picked it up like a big baby,” said Monaghan, 58, from the living room of his home on Monday. Mark Willis, the truck driver, said he had a sinking feeling – after his truck couldn’t go any further. At first, Willis thought all the tires on the passenger side went flat. Then, the asphalt started shooting out from underneath the truck, he said. Monday afternoon, bright red street cones surrounded a large patch of Conant Drive where the sinkhole appeared. Large areas of brown mud seeped through cracks in the asphalt. After the truck sank, crews pumped out about 17,000 pounds of fuel into another truck to lighten the load so that cranes could lift the vehicle out of the hole. 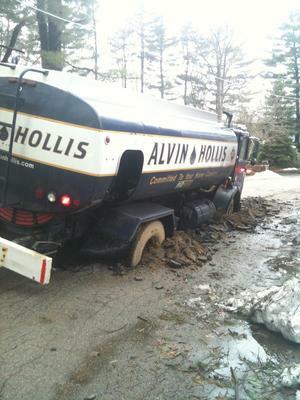 “We’ve certainly on driveways had some issues, but I don’t recall ever having had a vehicle fall into a road, ever,” said Jim Bicknell, owner of the Weymouth-based Alvin Hollis & Co. He said the vehicle checked out “completely fine” for its weight limit. Michael Thoreson, Brockton’s Department of Public Works commissioner, said he’s not sure exactly why the sinkhole occurred. “It could be water underneath the pavement. The pavement just gave way,” Thoreson said. Last year, the city saw a couple of similar incidents, where water ran underneath the asphalt top and “kind of erodes the bottom,” he said. “Another issue could be a private subdivision where the road wasn’t built to specification … over the years that breaks down,” he said. City crews are assessing damages on Conant Drive, he said. It was unclear on Monday when the street would be fixed, since Conant Drive is a private road and is not eligible for state or federal funding, Thoreson said. “We’ll figure out what it looks like to fix, see what we got in the budget and see if we can get it fixed,” he said. Shelley Monaghan, who lives on Conant Drive, hopes that happens soon. “We’re on a cul-de-sac. I don’t know how fast it’s going to get fixed,” she said. This entry was posted in Pictures, Vehicle v Sinkhole and tagged Massachusetts, sinkhole, truck. Bookmark the permalink.